Ubuntu is aiming to create its own file manager for Unity 8. Soon this file manager will replace the nautilus in its future versions of desktop. Ubuntu 14.10 is likely to start using converged QML applications on the desktop by default. Ubuntu’s plan is to switch to Unity 8 for Ubuntu 14.10 and along with it, it seems that some converged QML applications that are currently running on the phone and tablets might make it to the desktop. A new thread in the Ubuntu developer mailing list has been started by Ubuntu developer Oliver Grawert on convergent apps. In the thread, titled “Default File Manager with Unity8 in future desktops”. At the current development state, Ubuntu Filemanager App is not exactly ready for the desktop. The development is going on and it will replace nautilus soon. The new file manager will bring features such as a dual pane, tabs support, a proper search, extensions support and so on, even though some of these features don’t make sense on the phone or table, because after all, it will also run on the desktop. The development on the file manager app for Ubuntu Touch is on full swing, work specific to the desktop version is yet to begin. The thread looks to be initiated to discuss and gather requirements from the developers and the Ubuntu community. 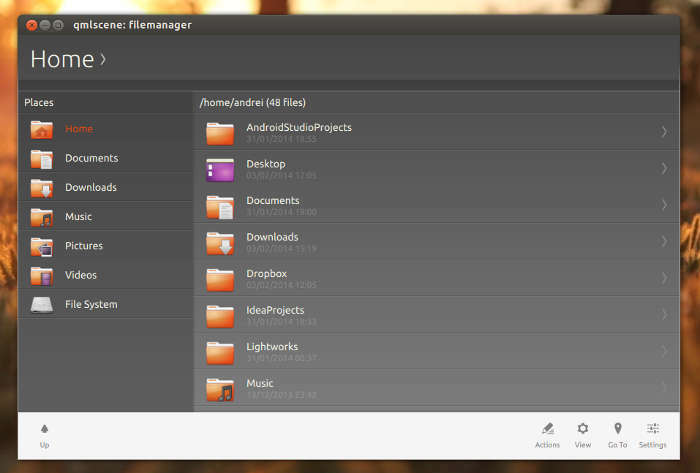 We will get a preview of the file manager on Ubuntu 14.04 with Unity 8 Desktop.